I live in rural Cheshire, with four conurbations about 12 miles north, south, east and west. I'll start with my most common haunt, Wrexham, across the border in Wales to the west. Here are two of my favourite places in the town centre, St.Giles' Parish Church, which you've seen before, where I play regularly in orchestral concerts, and 'The Nag's Head', the pub beneath it, where I and fellow musicians eat between rehearsals and concerts (and every other time I get the opportunity). St.Giles is remarkable for its tower, very tall for its 15th-16th century period, and 'the wonder of Wales' at the time The pub is on the site of a 19th century brewery, and its chimney is part of the pub. 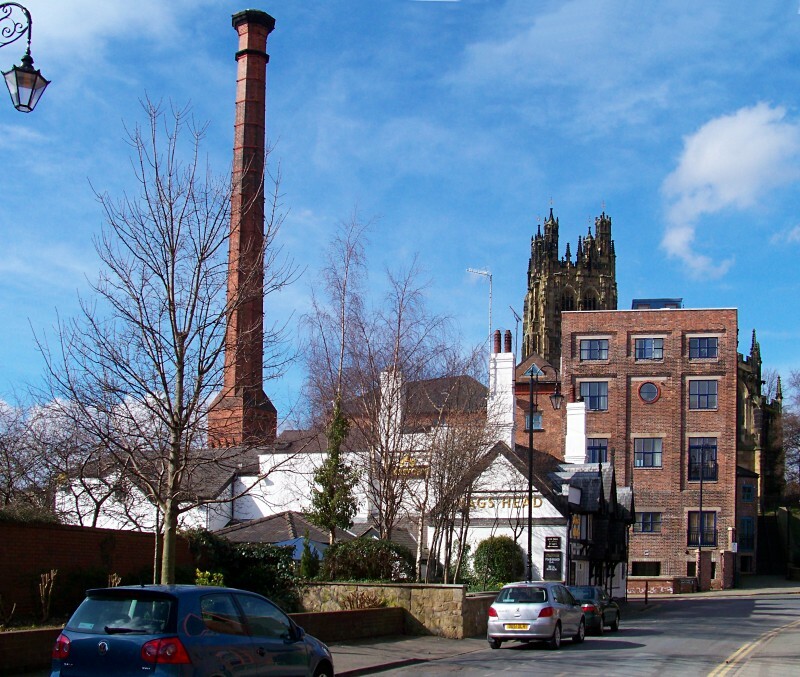 The warehouse obscuring the church, recently converted to upmarket apartments, was part of the brewery as well. The church bears a plaque in place of a stone removed in 1918 and presented to Yale University, USA, whose benefactor in 1718, Elihu Yale, a native of Massachusetts, lived &amp; died in Wrexham, and is buried near the tower. Another town centre pub, probably about the same age as the N.American Yale University, is the 'Horse &amp; Jockey'.I frequent this one regularly as well, as it's close to another favourite haunt -'Wrexham Cameras', who are very cheap, to suit the clientele including me, and who possess a wondrous photographic printing machine. The pub's survival as a thatched cottageamid numerous multi-storey buildings, some very new, is remarkable. It had a miraculous escape last year when there was a serious fire on the adjacent building site (now occupied by a horrible building in the background on the right). The firefighters must have performed brilliantly to keep sparks from igniting the thatch. In summer I enjoy sitting outside in the thoughtfully provided chairs. These are now mostly occupied by smokers, banned from British pubs. It's the nearest I get to a Paris pavement cafe. Sadly, the sun never strikes there in winter, and in summer drips from heavily-watered beautiful hanging baskets land in one's beer. Beautiful pictures. I'd love to visit there sometime. Alan, it's hard to really appreciate the village from the ground view. Think you could scale that tower and give us a bird's eye view? :-) Seriously, appreciate both your shots and your accompanying explanations. ...appreciate the village from the ground view...scale that tower and give us a bird's eye view? Not so much a village, as the largesttown in North Wales, a 'County Borough' in its own right. Craving Selvin's &amp; Cal's indulgence's, I just hopped in my time machine to June 2006, the only time I've been up the tower. It's open occasionally. 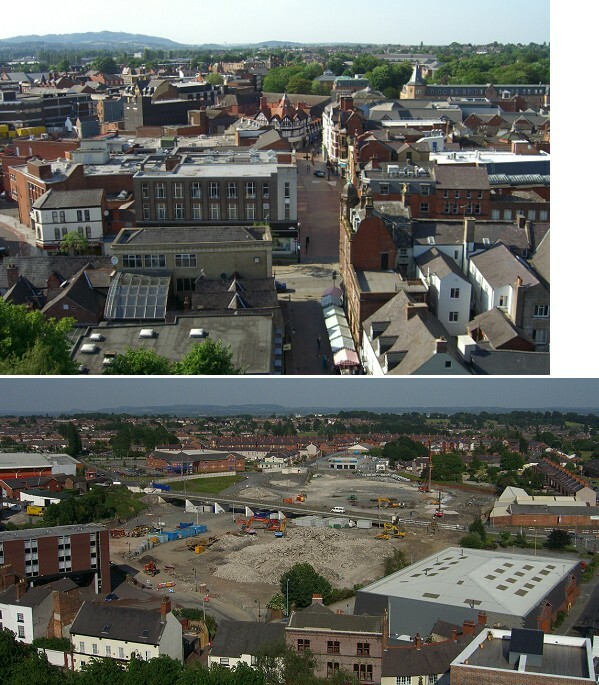 The first image is the view north, over the hotch-potch mess of the town centre. It's not very planned!The secondis the site of the mall. It used to be a weekly market site with hundreds of stalls, and a car park. The flyover has gone, and the traffic goes (slowly) round the mall. I live in the hills on the distant eastern skyline, in England. The rectangular roof at bottom right is the old warehouse/new flats, from the 'Nag's Head' picture earlier. Thanks. I wouldn't rush to Wrexham; you've now seen nearly everything of note in town (one more to come tomorrow)! There are, however, many beautiful, interesting, and scenic attractions in the surrounding countryside and villages. Great pics Alan, looks like a lot of interesting old buildings to shoot, as for the hotch-potch mess as you said looks like a typical New England town where they turned old cow paths and Indian trails in roads. Thanks for sharing. I love David and Goliath stories. The old chimney stands proudly and what a history! 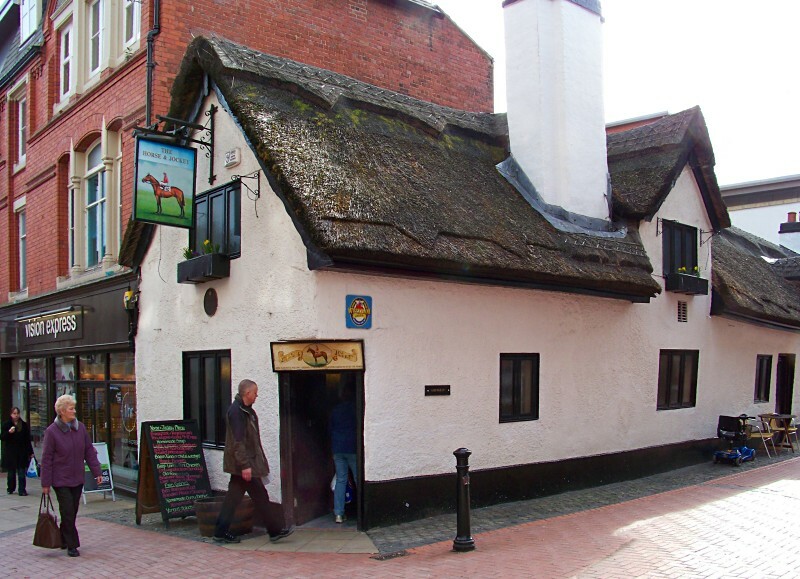 Is the roof of the pub real thatch? or just fake? Love the simple design added to it. Thanks, Selvin. Yes, it's real thatch. It was fortunate to become a 'Listed Building' under our planning laws well before developers became as rampant as they are now. Many folk living in interesting old houses find this irksome, as they are very restricted in what they can do in the way of improvement and modification. I live in the 1840-ish cottage and its neighbour where Wilfred Owen is said to have had his first flowerings of youthful poetry, but as it's been knocked into aboring cuboid block with a flattened pyramid on top, the interest lies in its surroundings &amp; history,and not the house. We just played with Google Earth (to see what daughter on holiday in Madeira would be seeing), and I found that its depiction of Wrexham shows the new shopping mall site in exactly the state it was in my shot above from the top of St Giles' tower, years ago! You do get a good view of the swinmming pool roof, though (see my "60's &amp; 1970" post).